Numerous crosswinds are buffeting the more than 40-year-old People's Republic of China--American relationship, yet only once since Nixon's historic trip to China in 1972 has a major conflagration seemed a real possibility. Anchoring the relationship throughout multiple storms are the two countries' broad areas of collaboration such as deep links in culture, economics, and education. However, for some observers, the conflictual aspects of the relationship seem to be gaining prominence. Conflict and Cooperation in Sino-US Relations offers a timely and current look at one of the world's weightiest bilateral relationships. 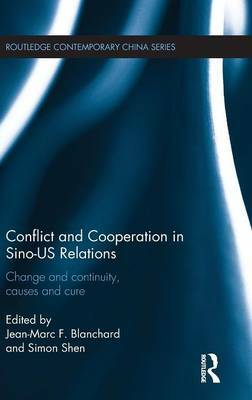 It goes beyond detailing the conflict and cooperation that have been integral facets of China--US interactions since 1972, to gauging the relationship's evolution and future trends, examining its nuances regarding diverse issues such as the Asia-Pacific leadership structure, the South China Sea, and the Korean peninsula. The book further delves into the causes of conflict and cooperation, offers diverse solutions for tempering frictions between Beijing and Washington, and considers the efficacy of some of the mechanisms (e.g., military-to-military exchanges) that China and the US currently employ to manage their relationship.The chapters suggest that extreme anxieties about China--US relations may be misplaced, but that there nonetheless are some worrisome signs even in areas like economics and the environment that are perceived as naturally cooperative. While the book does not offer any silver bullets, various contributors contend that successful management of Sino-American relations may require greater American accommodation of China's interests. This book will be of great interest to students and scholars of Chinese politics, American politics, international relations, and Asian studies, as well as to policy-makers working in the field.